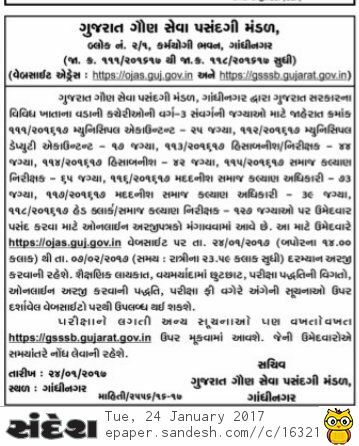 Gujarat Subordinate Service Selection Board (GSSSB) invites Application for the post of Accounts, Inspector and Head Clerk. Apply Online before 07 February 2017. 0 Response to "Gujarat Subordinate Service Selection Board – GSSSB Recruitment 2017 - ojas.gujarat.gov.in"